If you liked Deadhouse Gates you might like these books. In the vast dominion of Seven Cities, in the Holy Desert Raraku, the seer Sha'ik and her followers prepare for the long-prophesied uprising known as the Whirlwind. 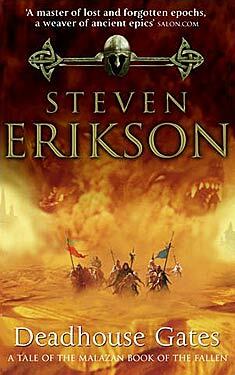 Unprecedented in size and savagery, this maelstrom of fanaticism and bloodlust will embroil the Malazan Empire in one of the bloodiest conflicts it has ever known, shaping destinies and giving birth to legends . . .
A corkscrew plume of dust raced across the basin, heading deeper into the trackless desert of the Pan'potsun Odhan. Though less than two thousand paces away, it seemed a plume born of nothing. From his perch on the mesa's wind-scarred edge, Mappo Runt followed it with relentless eyes the colour of sand, eyes set deep in a robustly boned, pallid face. He held a wedge of emrag cactus in his bristle-backed hand, unmindful of the envenomed spikes as he bit into it. Juices dribbled down his chin, staining it blue. He chewed slowly, thoughtfully. Beside him Icarium flicked a pebble over the cliff edge. It clicked and clattered on its way down to the boulder-strewn base. Under the ragged Spiritwalker robe---its orange faded to dusty rust beneath the endless sun---his grey skin had darkened into olive green, as if his father's blood had answered this wasteland's ancient call. His long, braided black hair dripped black sweat onto the bleached rock. Mappo pulled a mangled thorn from between his front teeth. 'Your dye's running,' he observed, eyeing the cactus blade a moment before taking another bite. The unlikely pair turned back to their small campsite, tucked between two towering spires of wind-sculpted rock. There was no hurry. Icarium sat down on a flat rock and proceeded to oil his longbow, striving to keep the hornwood from drying out. Once satisfied with the weapon's condition, he turned to his single-edged long sword, sliding the ancient weapon from its bronze-banded boiled-leather scabbard, then setting an oiled whetstone to its notched edge. Mappo struck the hide tent, folding it haphazardly before stuffing it into his large leather bag. Cooking utensils followed, as did the bedding. He tied the drawstrings and hefted the bag over one shoulder, then glanced to where Icarium waited---bow rewrapped and slung across his back. Icarium nodded, and the two of them, half-blood Jaghut and full-blood Trell, began on the path leading down into the basin. Overhead the stars hung radiant, casting enough light down onto the basin to tinge its cracked pan silver. The bloodflies had passed with the vanishing of the day's heat, leaving the night to the occasional swarm of capemoths and the batlike rhizan lizards that fed on them. Mappo and Icarium paused for a rest in the courtyard of some ruins. The mudbrick walls had all but eroded away, leaving nothing but shin-high ridges laid out in a geometric pattern around an old, dried-up well. The sand covering the courtyard's tiles was fine and windblown and seemed to glow faintly to Mappo's eyes. Twisted brush clung with fisted roots along its edges. The Pan'potsun Odhan and the Holy Desert Raraku that flanked it to the west were both home to countless such remnants from long-dead civilizations. In their travels Mappo and Icarium had found high tels---flat-topped hills built up of layer upon layer of city---situated in a rough procession over a distance of fifty leagues between the hills and the desert, clear evidence that a rich and thriving people had once lived in what was now dry, wind-blasted wasteland. From the Holy Desert had emerged the legend of Dryjhna the Apocalyptic. Mappo wondered if the calamity that had befallen the city-dwellers in this region had in some way contributed to the myth of a time of devastation and death. Apart from the occasional abandoned estate such as the one they now rested in, many ruins showed signs of a violent end. His thoughts finding familiar ruts, Mappo grimaced. Not all pasts can be laid at our feet, and we are no closer here and now than we've ever been. Nor have I any reason to disbelieve my own words. He turned away from those thoughts as well. Near the courtyard's centre stood a single column of pink marble, pitted and grooved on one side where the winds born out in Raraku blew unceasingly towards the Pan'potsun Hills. The pillar's opposite side still retained the spiral patterning carved there by long-dead artisans. Upon entering the courtyard Icarium had walked directly to the six-foot-high column, examining its sides. His grunt told Mappo he'd found what he had been looking for. 'And this one?' the Trell asked, setting his leather sack down. 'Some would consider your curse a gift,' Mappo said, a flicker of sadness passing across his features. 'No,' Mappo agreed. It was another hour before the moon would rise. He watched Icarium lay out six long, stone-tipped arrows, then squinted out into the darkness. Cold fear crept along the nape of his neck.